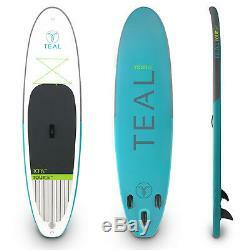 Teal TOURair Inflatable Paddleboard - 10'6" x 32" x 5. 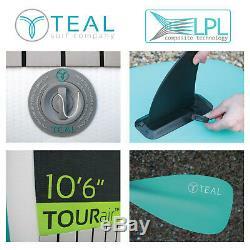 Introducing the Teal TOURair inflatable stand up paddleboard - manufactured using Teals exclusive Liquid Pre-lamination Composite (LPL) construction process. The TOURair is the ultimate all-round paddle board, ideal for all abilities and styles. The materials and construction methods ensure the board is highly durable, lightweight and fun whilst still being able to roll it up and transport it anywhere with ease. The board's high volume, coupled with its stable rocker and rails allow paddlers to find their feet and explore coastlines, rivers and lakes with ease. The TOURair comes with everything included so you can just pump up and go. The boards come with: 3 fins, one larger central removable box fin and two smaller side bites, ensuring great glide and tracking. All three models are then finished with Teal? S high quality detailing including on-deck bungee for storage, crocodile skin and teal effect EVA deck pad for grip and a central carry handle. What's included in the package? 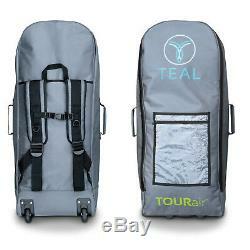 Teal Transit Carry Bag heavy duty 1680 Denier ballistic nylon, wheeled carry bag with backpack straps. Teal Adjustable Alloy Paddle ergonomic T-grip handle, reinforced nylon blade and adjustable height (Carbon Fibre option available). 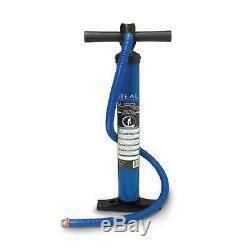 Teal SUP3 HP Cyclone Pump double action, 2-stage pump inflates on both the up and down strokes. Teal 10-foot Coiled Leash strong PU, swivel coiled leash ensure nothing is dragging in the water. Removable Box Fin the central fin is removable so the board can be easily rolled up. Compression Belt - heavy duty strap with adjustable strap and buckle to keep the board rolled up in the bag. Repair Kit comes with patches, strong adhesive and valve spanner for tightening or removing the valve. User Manual detailed user manual featuring set-up instructions, safety advice and paddling tips. 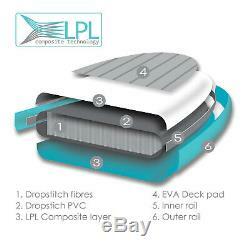 LPL Composite Liquid Pre-Lamination Composite. This process is one of the most recent and advanced technologies available in the inflatable SUP market and rivals the manufacturing process used by some of the other big iSUP brands. The LPL process involves coating the dropstitch thread structure with a layer of uniquely developed adhesive that seals and bonds the materials. A sophisticated machine then precisely pre-laminates the durable PVC outer to this adhesive layer, creating a shell that is very strong, very stiff and far lighter than other methods. This has completely eliminated the manual gluing process involved in the traditional double layer construction method and as a result removes the weight of excess glue and the potential for human error. The LPL process creates the perfect combination of performance, durability and quality and ultimately allows Teal boards to be inflated to higher pressures, making the boards stiffer and more responsive whilst reducing the overall weight of the board. LPL is exclusive to Teal. Carbon Fibre Shaft Paddle Option. The Legacy hybrid carbon fibre shaft paddle offers a new, advanced level of paddle boarding performance. The paddle is constructed from an ultra-lightweight, 100% carbon fibre shaft with a reinforced PU blade. The combination of the rigidity of the blade, the strength of the shaft and the ergonomic T-grip handle allows for a more powerful stroke leading to more efficient performance and less chance of fatigue. Choosing an iSUP: which size is right for me? When choosing the length of a paddle board, think about where you want to paddle. Riding waves in the ocean and paddling on a calm lake are very different styles of paddle boarding and require different length boards for the best performance. The great thing about inflatable paddle boards in that storage and transport isn't as much of a consideration as solid boards as they all neatly roll back into the supplied carry bag. Medium boards (10' to 11'): Ideal for all-around use on calm lakes, rivers and can also be used in the surf. Their stability and versatility make these boards incredibility popular among first time riders as they can explore all aspects of the sport with the one board. Long boards (12 and over): Great for cruising and touring. Long boards are faster than short and medium boards and they tend to track straighter. They cover longer distance with relative ease and are more stable due to their higher volume. Great for longer paddles and bigger people. SUP Volume and Weight Capacity. A SUP board must work for your size. If the board doesnt displace the correct amount of water for your weight, you wont be supported. Board volume and weight capacity are two important factors to consider. Volume: A paddle board's volume, expressed in litres, gives an indication of the boards ability to float with weight on it. Generally, the higher the volume the more weight the board can support and higher the board will float in the water; it will also have less drag and be easier to paddle. This is at the expense of manoeuvrability however, hence surf SUPs have less volume than all-round or cruising SUPs. Weight capacity: Each paddle board has a riders max weight capacity; this is listed in kilograms on the table above. Knowing weight capacity is important because if you are too heavy for a board, it will ride lower in the water and be much more difficult to paddle. 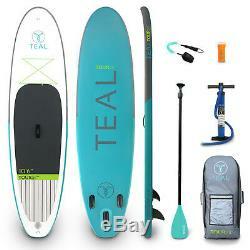 Teal TOURair iSUP Inflatable Stand Up Paddle Board SUP Package & Paddle Pump Bag. Mask, Snorkel & Fins Sets. 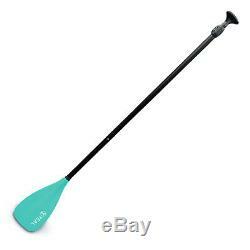 The Teal hybrid carbon fibre shaft paddle offers a new, advanced level of paddle boarding performance. Is the quickest and easiest way for us to process your order and for you to get your goods. After 7 days we will contact you with a final reminder, and give you another 3 days to pay. (Other areas and countries may incur a charge). This does not include weekends or public holidays. UK Highlands, islands and Republic of Ireland: We can deliver to UK Islands, the Highlands and also the Republic of Ireland but this does attract a surcharge from our carriers, and surcharge will be calculated for you and clearly stated at checkout. For outlying areas of the UK Express can take up to 3 days. Simply put the order back into the packaging it arrived in. If you do not have the original packaging, please put the item back in suitable packaging to adequately protect it. Complete the label you received on your invoice and stick onto the outside of the packaging. If you no longer have a label put a note inside with your full order details and the reason you are returning the item. Take the parcel to the Post Office or your preferred carrier. Return posting costs will be at your expense. The item "Teal TOURair iSUP Inflatable Stand Up Paddle Board SUP Package & Paddle Pump Bag" is in sale since Friday, August 3, 2018. This item is in the category "Sporting Goods\Surfing\Surfboards". The seller is "plus-out" and is located in Truro. This item can be shipped to North, South, or Latin America, all countries in Europe, all countries in continental Asia, Australia.